I’ve been meaning to go to Skillet Diner for ages, and last Friday James and I were in an eating out mood. It was Pride Weekend, so the whole neighborhood was celebrating and rainbowed up. We arrived about 20 minutes early for our reservation but there was room so they seated us straight away. We ordered cocktails to start – I had a Brunch 75 ($9) with vodka, st. germain, prosecco and grapefruit juice and James ordered a Smoky Paloma ($10) which was basically a grapefruity margarita. Later in the meal he ordered a Basically a Fancy Old Fashioned ($9) which used jicama-infused whiskey. They came in cute, teeny tiny hipster Mason jars. 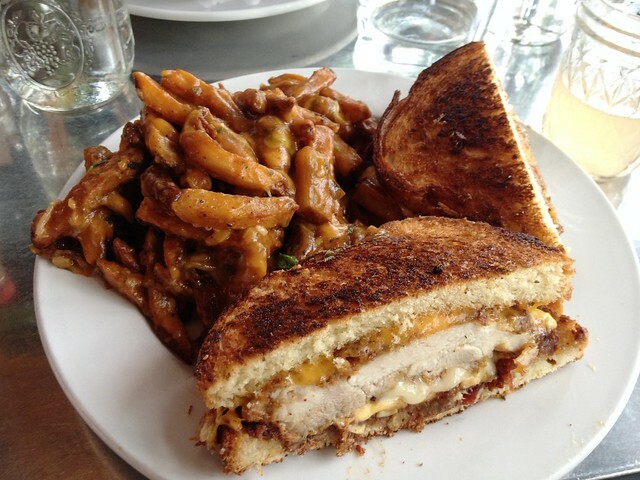 I had the ultimate grilled cheese ($11) with bacon jam ($2) and fried chicken ($5) and a side of poutine ($3). I could have gotten a side salad instead but I prefer the “heart attack on a plate” look. The poutine was crazy dense. It was also only a bit above room temperature, so even though it was tasty the combination of lukewarm-ness and sliminess was a bit off-putting. I probably would get fries next time. The grilled cheese was amazing! Perfectly browned and I loved the combination of the cheese, bacon jam and chicken thigh. I ate half the sandwich and maybe a third of the poutine. James polished off the poutine and I took the rest of my grilled cheese home for breakfast the next day. 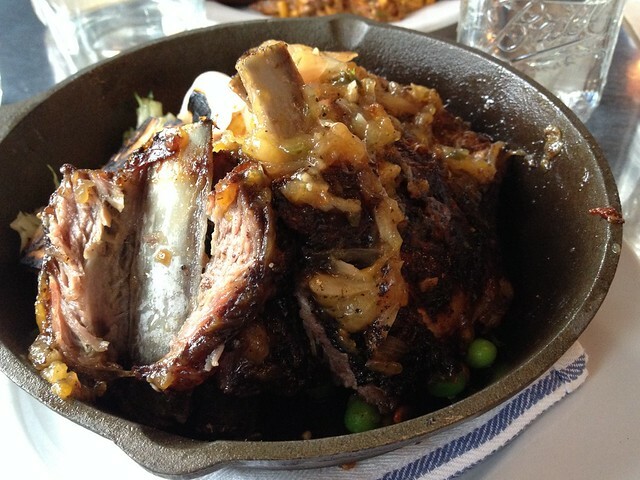 James ordered the special of the day – Denver lamb ribs – juniper coriander crust, yuzu marmalade, adobo marinated grilled pineapple, grilled corn, frisee, english peas and charred spring onions ($29). It came in a skillet (“how eponymous!” James might say). 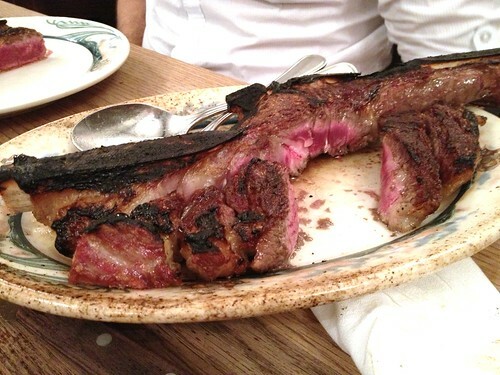 The meat was super tender and had a really interesting flavour. I think James particularly liked the marmalade, which added a touch of sweetness and wasn’t nearly as marmalade-y as you’d expect. It’s exactly the sort of meal I love ordering at restaurants – delicious with PITA flavour combinations that you would never consider making at home. Definitely worth ordering! We were super full at this stage – and remember that I’d only managed about half my meal. 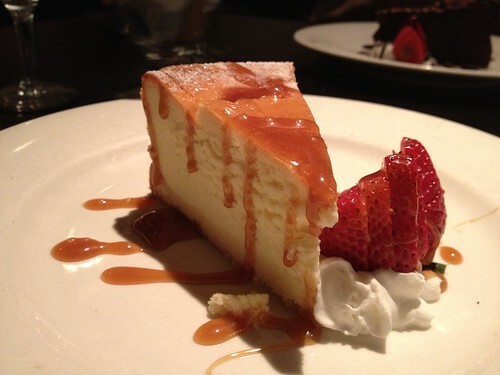 But when we eat out I always want to have dessert! James ordered the doughnut holes ($6). They were light, warm and fresh. Also way more massive than he had anticipated. It was nice but not outstanding; I’ve definitely had better cheesecakes. The strawberry layer was a bit too gelatin-y and I think it suffered from not having the usual ratio of topping to cheesecake. James definitely got the best of the ordering competition that night, but overall we were both really pleased with the meal. There were multiple menu items that I wouldn’t mind going back to try – namely the boozy shakes, some of the fried desserts and the fried chicken. The walk home initially started as a waddle, but the food wasn’t heavy in our stomachs for long – impressive given their fried-ness. I was expecting to feel way worse afterwards. 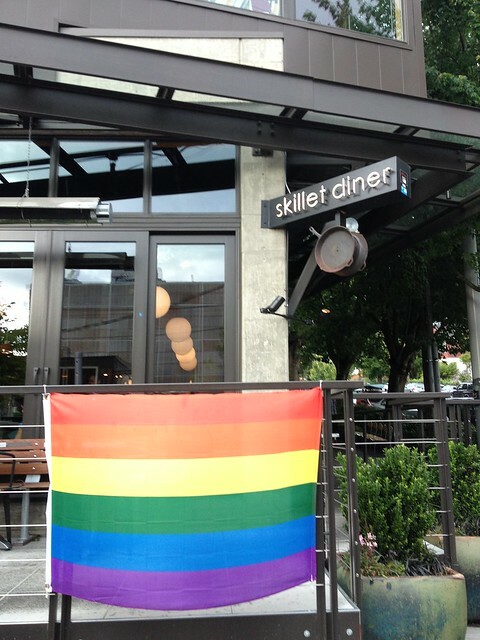 Perhaps it’s because we were in a good mood but we both agreed that Skillet Diner was one of the best dining experiences we’ve had in Seattle. It’s one of the few places here that’s lived up to the hype for me (the others that come to mind are Paseo’s and Shiro’s) and I’d highly recommend it. 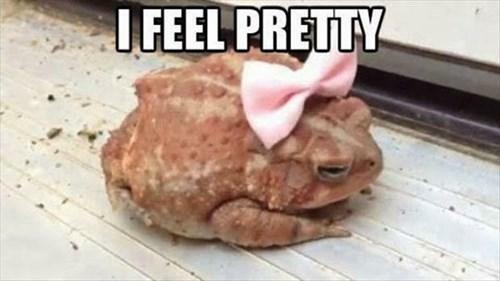 James has been working super long hours recently, so he took a day in lieu to partially make up for it. 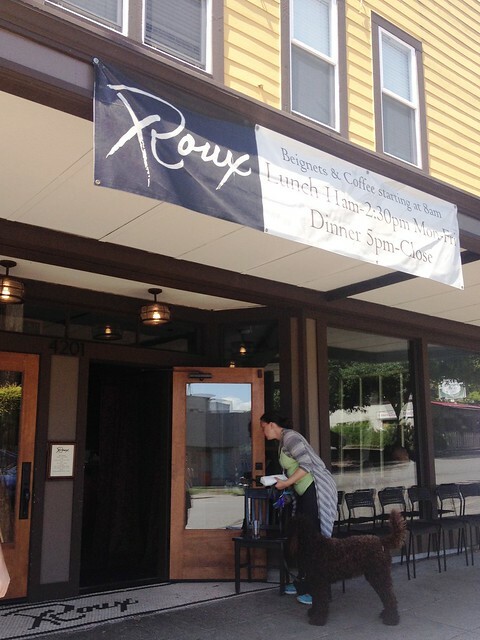 It was a good opportunity to try out Restaurant Roux in Fremont, since I’ve heard it’s good but the weekday lunch menu is the only one that strikes my fancy. Restaurant Roux started as the Where Ya At Matt food truck, which was rated one of the best food trucks in the country. I’ve never gotten round to visiting, even tough the food truck parks near our place on Mondays. My only other experience with Creole food was when we went to Brenda’s in San Francisco so I was pretty excited about Restaurant Roux. 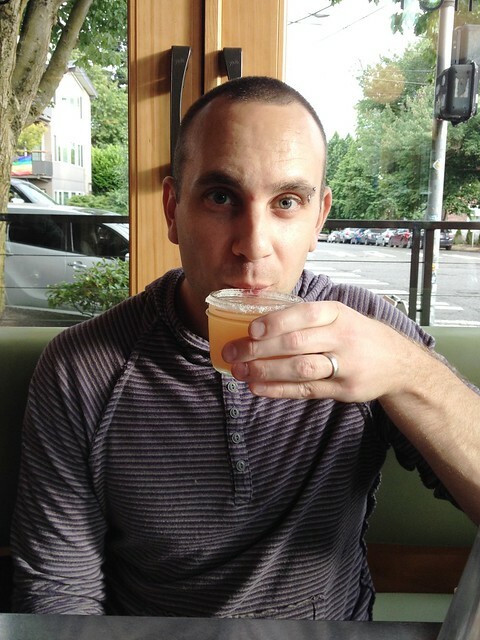 James got a lunch cocktail, because why not. 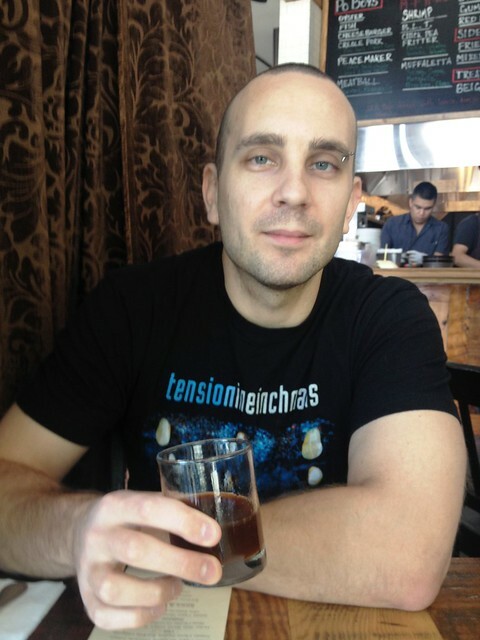 He ordered the Battle of New Orleans ($10), which was bourbon, anisette, absinthe and various bitters. He said it was good, but we both definitely raised an eyebrow when it arrived looking like dirty mop water. It really could have done with a garnish or something to make it look a little less gross. But when your cocktail comes out like a bag of brown I guess there’s only so much you can do. They arrived already conveniently cut in half. 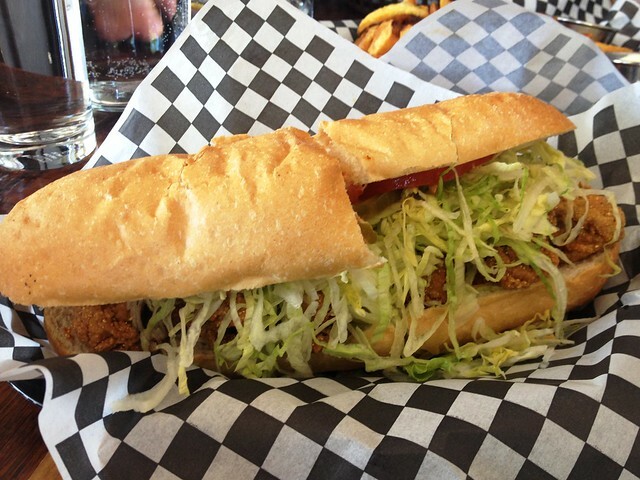 The oyster po’boy was the clear favourite. There were fewer oysters than on the po’boy from Brenda’s, and I didn’t like the bread they used as much (it was kind of flimsy), but I think the actual oysters were nicer and the batter was nice and airy. Although I enjoyed the oysters more than I did at Brenda’s, it confirmed that fried oysters just aren’t my thing. 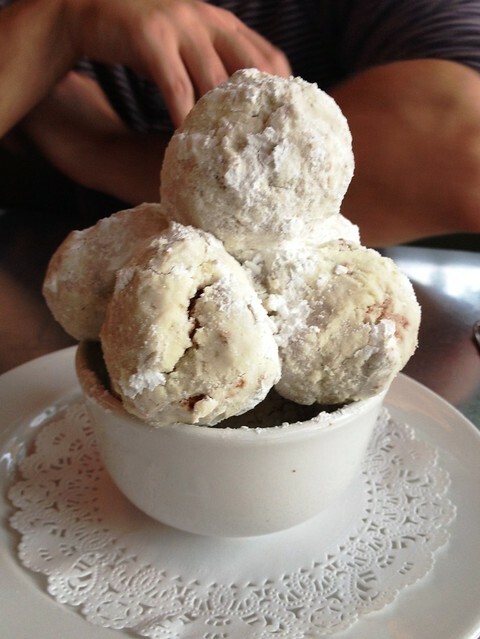 But if they’re yours, I think Restaurant Roux does them well. 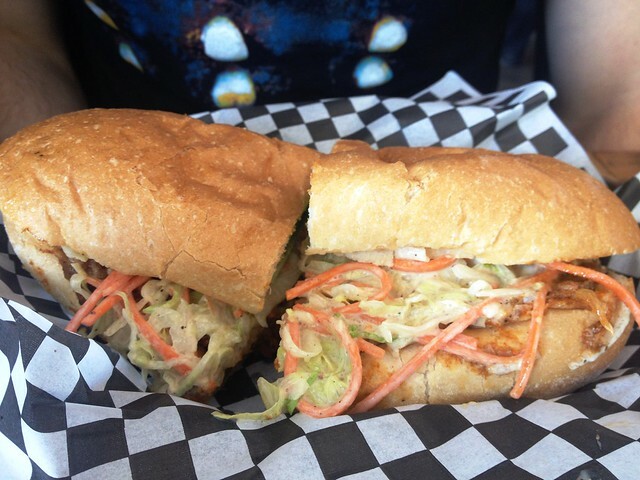 The Creole pork po’boy was super messy to eat and had a kind of bitter aftertaste that I didn’t like. I gave some of mine to James when I realised I wasn’t going to have room for dessert afterwards. 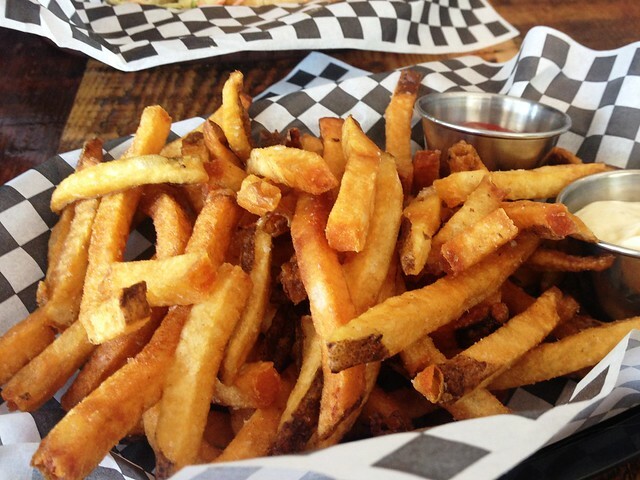 No complaints about the fries! I also like the fries in mayo thing – is it a Southern thing? They came covered in a lifetime supply of icing sugar. James said they reminded him of the Vic Market donuts, but I think beignets are less dense (and obviously they don’t have jam). I enjoyed them but preferred the flavoured beignets at Brenda’s. 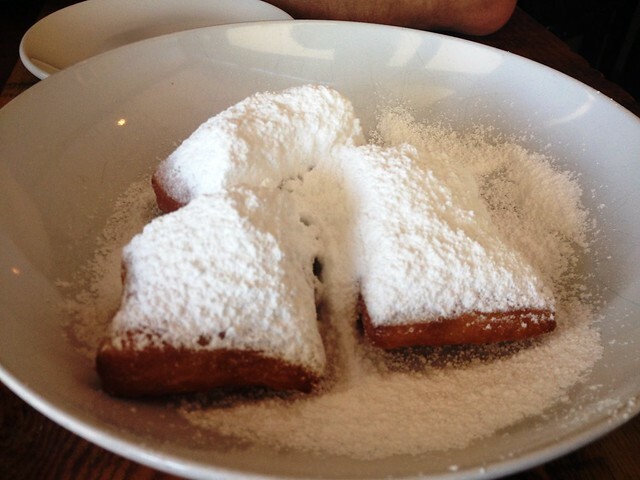 Nothing against the quality of the beignets at Restaurant Roux – the plain ones were my least favourite flavour at Brenda’s too. We left feeling very full, and it was super nice having a leisurely weekday lunch. I think overall I wasn’t wowed enough to make a special trip out for it again, but if I’m feeling sandwichy on a Monday I’d definitely go to the food truck to try a muffaletta. For my birthday James and I went to The Corson Building which is one of those farm-to-table restaurants that is so popular in Seattle. It’s gotten great reviews and is on the pricier side ($100 a head plus $40 wine pairing) so I had pretty high expectations. 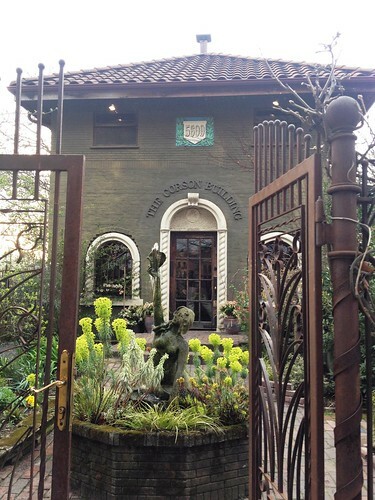 We went on a Saturday since that’s when they have a more elaborate tasting menu. First of all, the location is beautiful. It’s in industrial Georgetown but looks like an upscale French cottage. When we arrived we were given an apertif to sip while we strolled around, which felt pretty chic. The inside was very loud (which they warned us about at the start of the night) – it’s one of those interiors where sound bounces off everything. Motherfucking family style communal dining. It’s not mentioned obviously on the website, but it is (kind of) there. In the What We Do section it says “sharing at the table, we can open up our senses and our consciences to our place in the world, along with the place of our neighbors”. I thought it meant figuratively, like the restaurant is sharing its food with you – not literally, in that you have to share your food with complete strangers. Part of that is my bad, because I’d deliberately avoided reading reviews of the restaurant so as not to spoil the surprise. It is mentioned in a few reviews, but you’d think they’d have it prominently on the website. Looking at the reviews, I’m not the only person who felt a bit blindsided. We were fortunate that our table was really friendly and we got along really well with one particular couple. But even when you get along, when you’re chatting with new people you have to be “on” in a way that you’re not normally, you know? And imagine how awful it would be if you were seated with shitheads. So that was OK. But then it was freaking family style dining! I mean, there was plenty of food, but at a high-end meal I’m not expecting to have to pass a heavy dish around the table and try to estimate the size of “my” portion. Communal dining? Fine. Family style with a private table? Also fine. Put the two together? Oh HELL no. It matched the ambiance really well – European rustic but modern. James’ favourite dish was the rabbit. I liked the salad and the scrambled eggs the best (and the bread!). 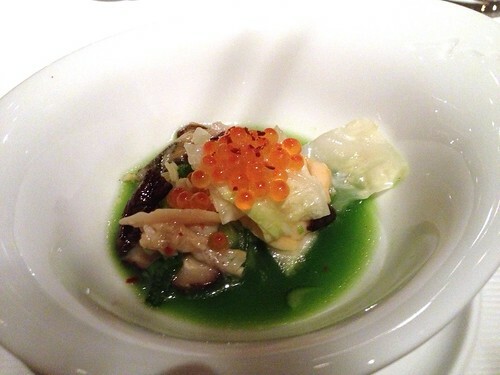 There were one or two individual dishes – the tart and possibly the scallop. I don’t know if I’m just a grump, but food has to be pretty outstanding for me to put up with that communal family style nonsense. But anyway, setting that aside, while everything was very good none of the dishes were particularly memorable. Which was a disappointment given The Corson Building’s reputation and price. It didn’t help that our Lazy Bear experience (also communal seating, but not family style) was still in recent memory and The Corson Building fell far short of that. On the plus side, the wine pours were generous, the waiters were great, and the actual restaurant was beautiful. Everything was fine – fresh, tasty, interesting flavour combinations – but it wasn’t spectacular and given the awkward dining arrangement and price point … eh. I think I’ve had about 5 people recommend Umi’s to me, so it was only a matter of time before I caved in and tried it. 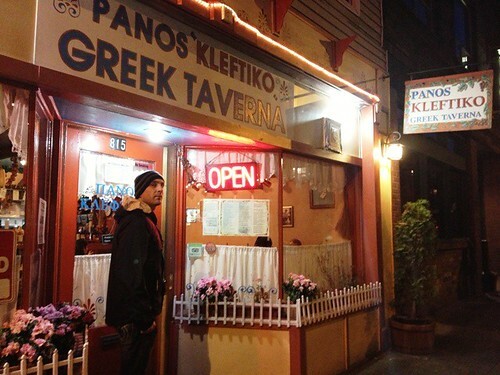 Last month when Julian came to visit we headed there for a late dinner (which was OK because it was happy hour 11pm onwards) The prices were lower but the waitress said that the portions were smaller too, so I don’t know if it worked out any cheaper. But that way we got to taste more dishes. They were very good and I think pretty good value for money. 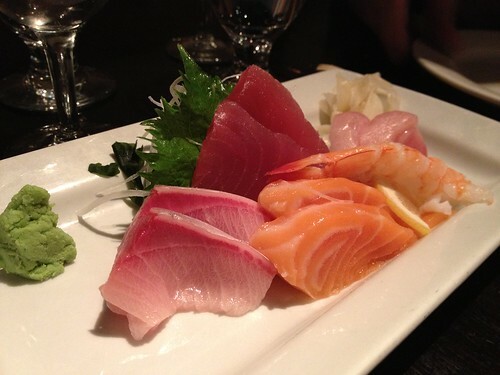 I’m not a fish expert but I’d say the sashimi was a step down from Shiro’s but overall much better value for money. Actually in general the whole meal was pretty reasonable – I think the most expensive thing we ordered was a bottle of sake. 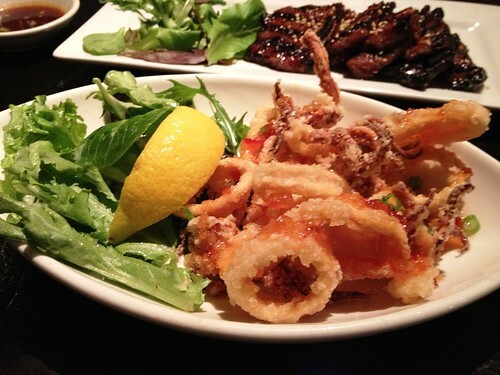 We also ordered some crispy calamari ($5.50) and grilled garlic short ribs ($6). I had a separate photo of the ribs but you can see them pretty well in the calamari photo. It’s been awhile but I remember the calamari being OK (not particularly crispy though) and the ribs were full of flavour but there wasn’t a lot of meat on the bones. At that price though, both are worth ordering. 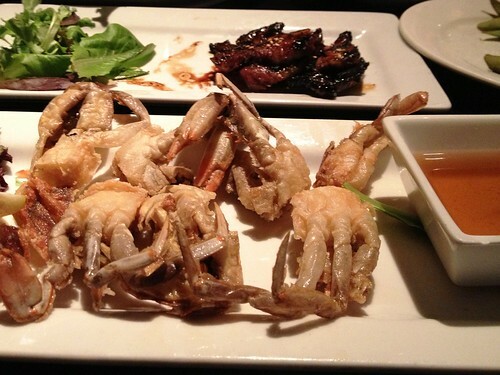 I also ordered some soft shell crab ($12) because I love it and always order it when I see it on the menu. I’ve had better – these ones were pretty small and didn’t taste as nice as ones that I’ve had in the past. 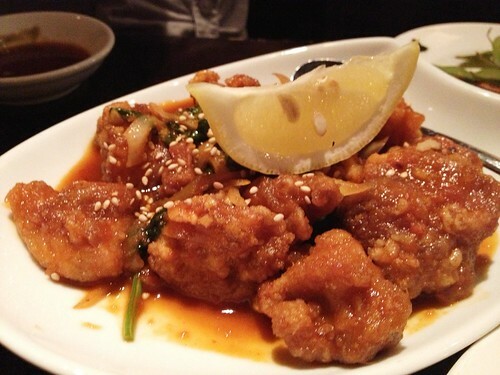 From process of elimination I think this must have been the spicy ginger chicken ($6). This was pretty good and, as I recall, disappeared quite quickly from our table. 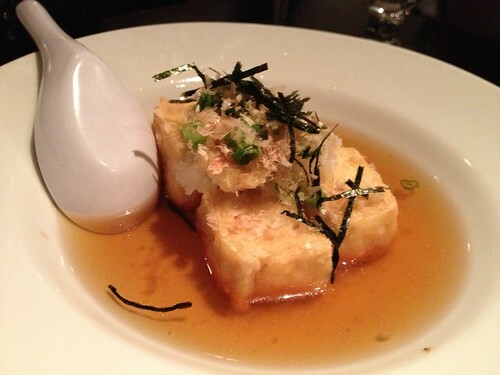 Also very popular was the agedashi tofu ($5) which had a nice, subtle miso soupish flavour. We were still hungry so we ordered another mixed sashimi platter and a small tempura platter ($5.50). Like the calamari the tempura was kind of flavourless and not as good as our favourite Japanese restaurant back in Melbourne (also the shrimp wasn’t nearly as large). But for $5.50 it was awesome value! Everyone was still not quite full so we all ordered desserts, which were $9 each. They were OK but we all agreed that the descriptions were pretty misleading. I ordered the green tea tiramisu, which sounded intriguing. 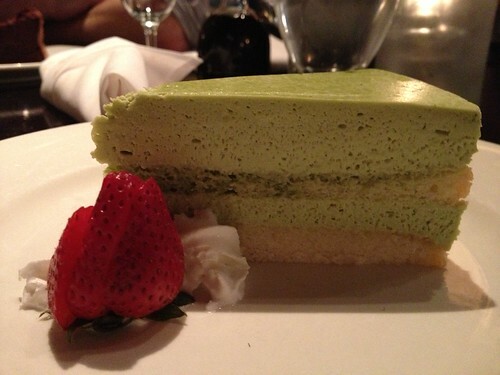 But seriously, how is this a green tea tiramisu? It didn’t even taste like tiramisu and it was basically a sponge cake! 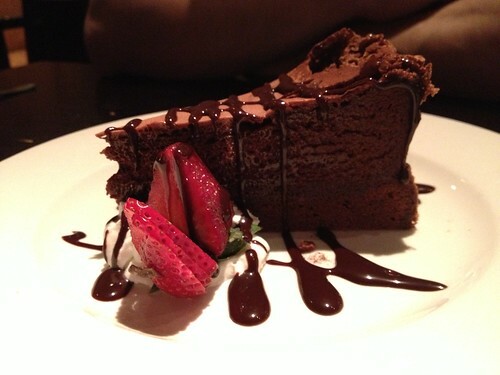 James ordered the gateau chocolat (why does a Japanese restaurant have a French name for chocolate cake?) and it was pretty good. 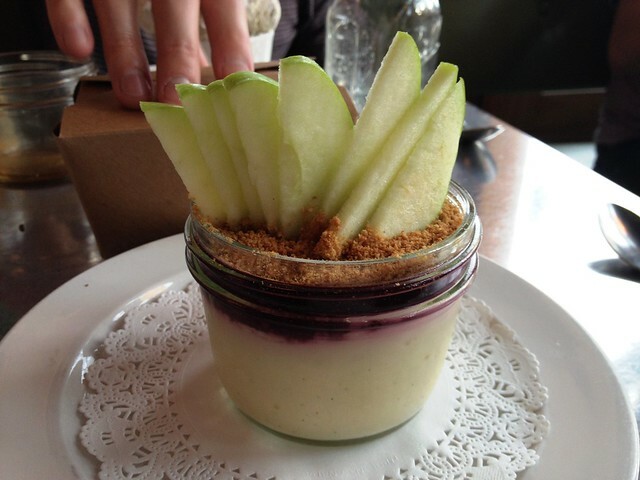 Julian got the souffle cheesecake because he was intrigued – how do you mix a light and airy souffle with a dense cheesecake? It turns out you don’t; this was a mousse tarted up to sound fancy. 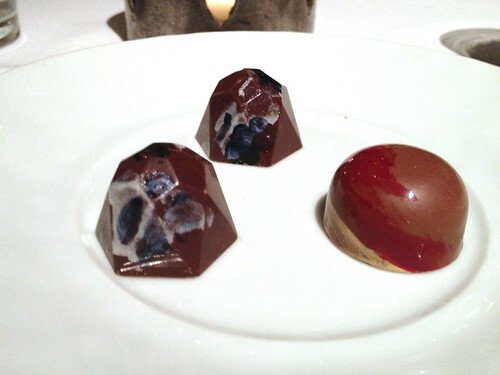 The desserts were fine, though a bit overpriced relative to what we received. Also I was pretty disappointed with the misleading descriptions – if I’d known what we were going to get I think I would have ordered my standby Japanese dessert of black sesame ice cream. Or else just kept eating off the regular menu until I was full. 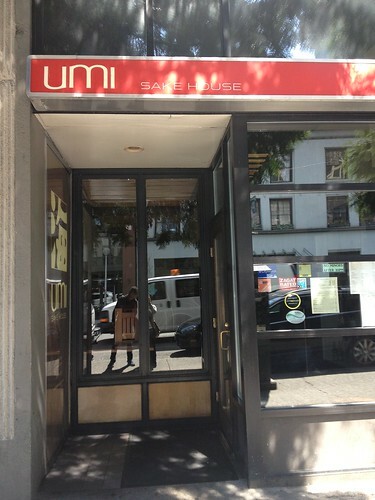 Overall Umi’s is very solid though not spectacular. But at happy hour prices I definitely recommend it – if you avoid buying booze and dessert it’s a cheap meal that punches far above its price point. 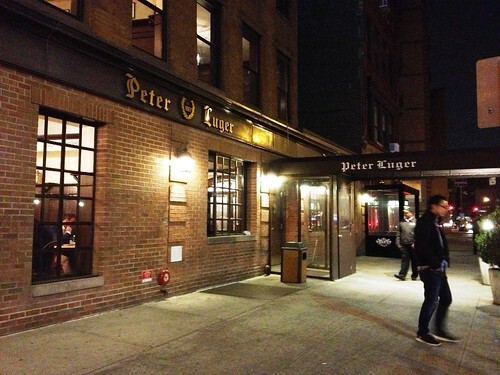 It was fairly empty when we went (around midnight on a weekday) but I’m told it’s very busy during regular hours. 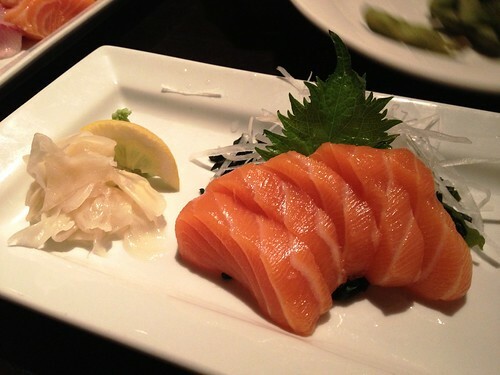 I hate crowds and I love cheap prices so it’s off to Umi’s next time we’re in the mood for a midnight snack. 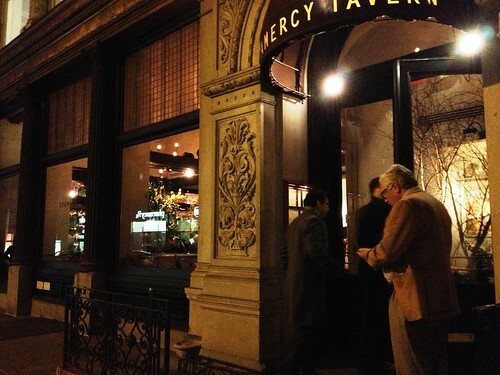 For dinner our second night we went to Gramercy Tavern. Although it was a pretty fancy restaurant we got a same-day booking. We had to all choose either the tasting menu or a la carte so we went with the tasting menu (mainly cos James and Jules didn’t care and I wanted to try the tasting menu). 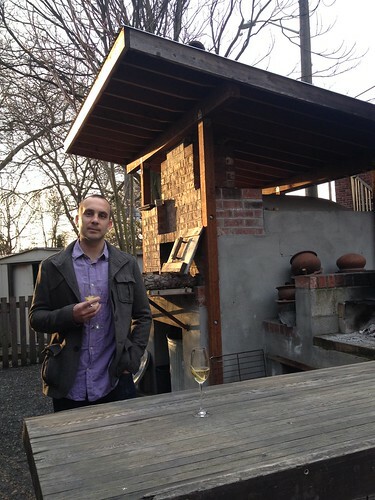 Julian was tasked with choosing the wine and he went with a 2007 Movia pinot noir ($98) which we all really enjoyed. They started us off with some ricotta in puff pastry. It was very good; light and not greasy. Peconic Bay scallops, clams, pickled mushrooms and cilantro broth. I thought the colours were beautiful and the cilantro broth offset the seafood very well (James was also very fond of the broth). 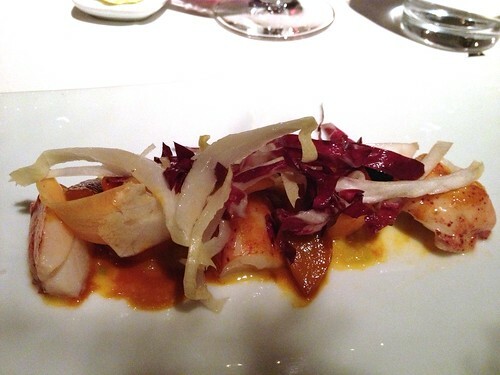 The next course was a warm lobster salad with carrots and chicory. The lobster was very tender but I don’t remember much about this dish, sorry! What I do remember is that the waiters would replace our cutlery for every course – the tip on a $100+ meal (plus wine!) is significant but they earned the tip a lot more than some other restaurants where they basically give you the food and disappear for the rest of the night. 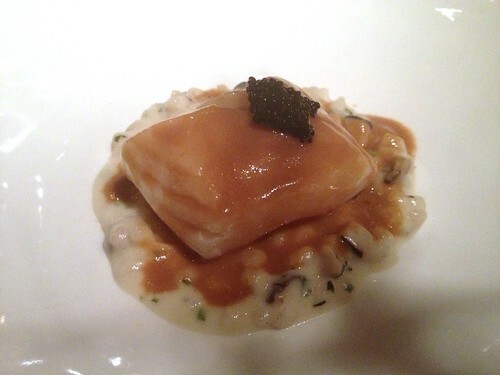 Next was halibut with shiitake mushrooms and parsnip lobster sauce. The sauce gave the fish an almost meaty taste and I enjoyed this a lot more than I was expecting to – I don’t normally care for fish but this was fish that tasted like lobster! 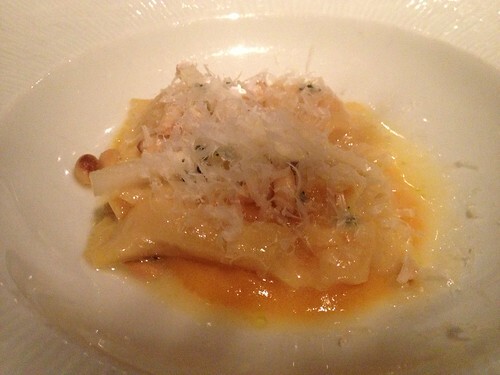 The next course was sweet potato agnolotti with kohlrabi and pine nuts. This tasted pretty much as you would expect from the description. 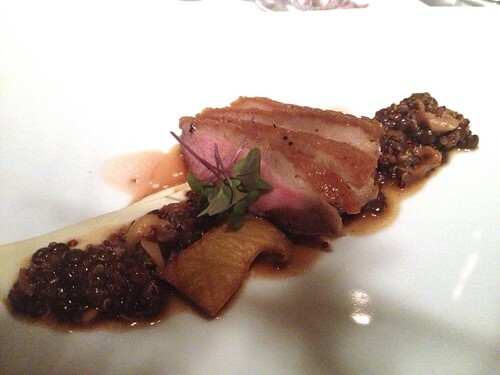 Then we had the final savory course, which was roasted duck breast with quinoa, lentils, celery root and hazelnuts. I am normally not a fan of how white people do duck – to me Chinese BBQ duck is perfection and everything else is a distant second. But I have to admit this duck was excellent. It was succulent and for some reason reminded me a little of pork. The quinoa was a bit eh but I loved the addition of hazelnuts. There was only one dessert on the tasting menu but they brought us an additional dessert. Yay! 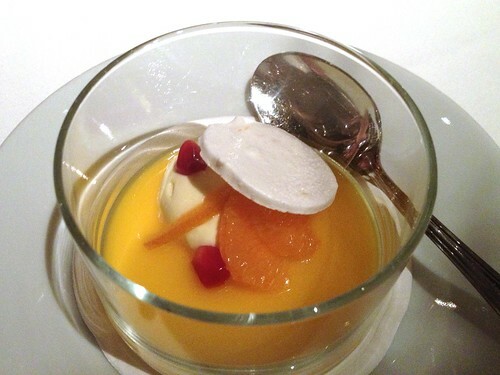 This was a mandarin orange panna cotta with a marscapone disc (we all agreed the disc tasted like meringue though). This was super light and refreshing. 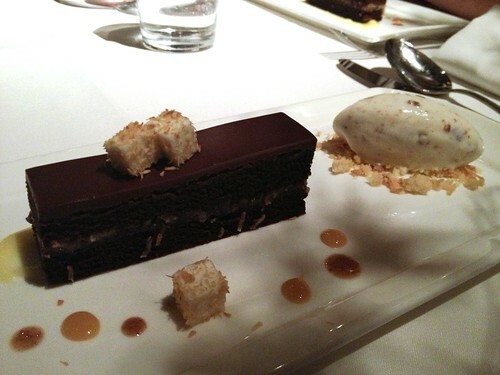 Our second dessert was a chocolate Pecan coconut cake with butter pecan ice cream. The cake wasn’t particularly memorable (I’m not a huge fan of the chocolate/toasted coconut combination) but OMG the ice cream was out of this world. It was light yet super rich and tasted of caramelized pecans. I wonder how hard it would be to recreate – I need this ice cream in my life. After dessert they brought us some petit fours. The macarons were coconut but I don’t know what the others were because I was in the bathroom. Everywhere we went I was terrified that there would be a bathroom attendant that I’d be expected to tip. Luckily this wasn’t the case here (though James and Jules did encounter one at another restaurant – more on that later). Julian was getting really full at this point, I was pleasantly full and I think James was just shy of full. 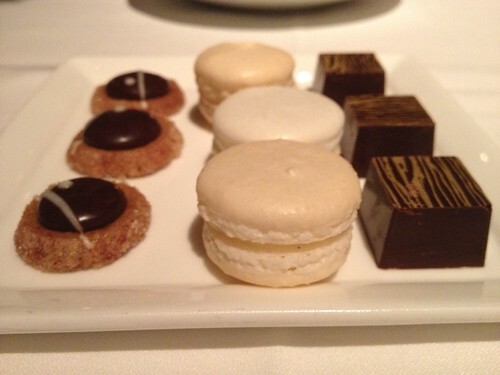 It all felt very genteel nibbling on our petit fours after dinner. They also brought us some after dinner mints. The two blueish ones were mints and the round one was a caramel. Overall it was a very competent meal. Julian and James said that they weren’t wowed for the price (including the wine, tax and tip it ended up around $200 a person) but I thought that everything was very well done. I probably wouldn’t go back, but only because there are so many other fine dining options in New York that I want to try. 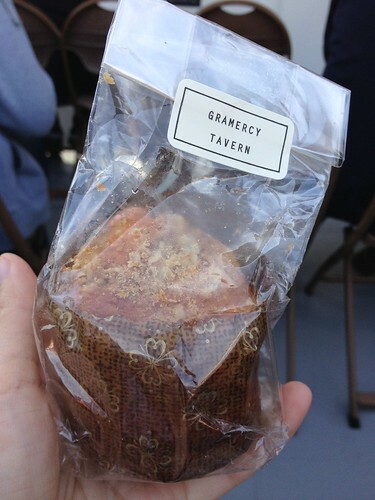 After Gramercy Tavern I was in that happy bubble that I’m always in after a really great meal. 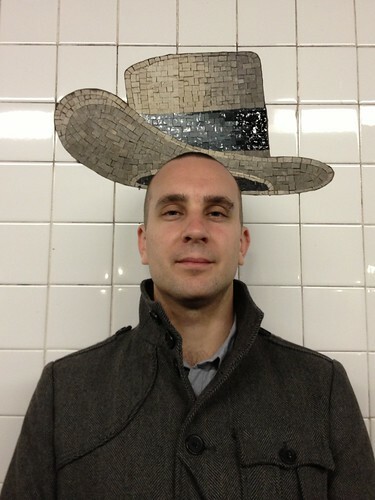 We walked to the subway, which was decorated with mosaic tile hats and took stupid photos. Oh yeah, at the end of our meal we each got a complimentary muffin to have for breakfast the next day. I actually ate it a couple of days later when we went on a boat trip and it was great! 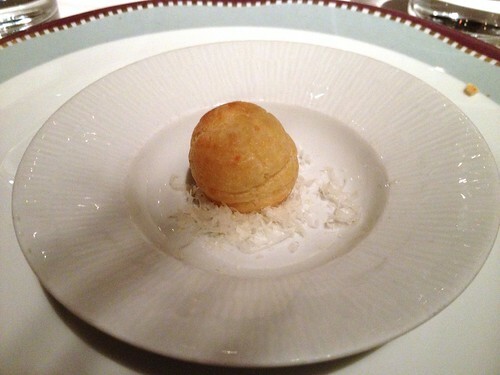 Toasted coconut (which they seemed very fond of as a dessert ingredient) and a delicious chocolatey centre. 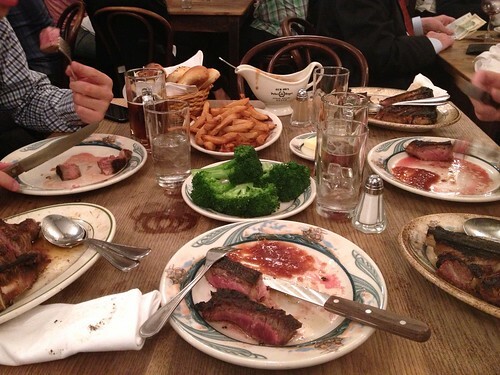 So that was the first (of a few) expensive meals in New York. Honestly though, New York wasn’t as pricey as I thought it would be. I think part of it was that I had always figured in a $2000+ plane trip from Australia, but Seattle is more like a $200-300 round trip. The food is about as expensive in New York as it is in Seattle (which in turn is comparable to Melbourne) but just worlds better. My theory is that if a restaurant isn’t excellent there’s just so much competition around that it goes out of business. 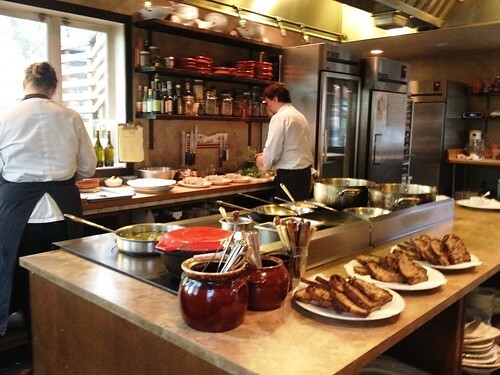 I could cry when I compare it to Seattle, where even mediocre restaurants are raved about. 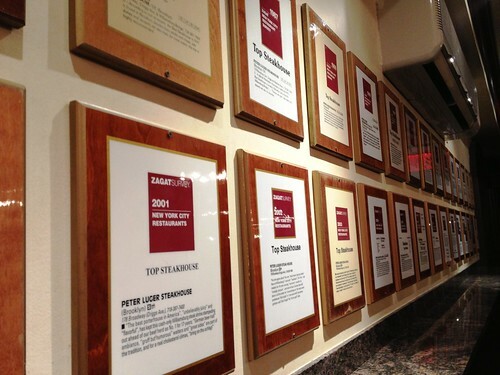 The restaurants were only a part of why we loved New York so much (James was talking about maybe looking for a job there in a couple of years) but they were a significant part! 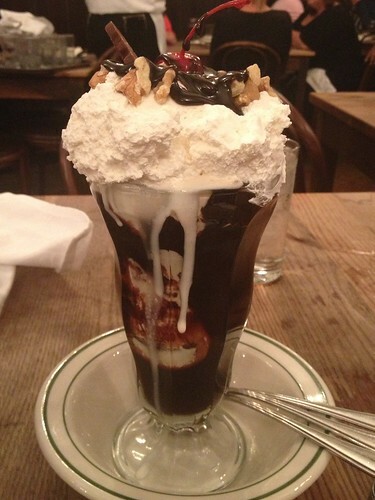 If New Yorkers didn’t do so much walking I’m sure they would all be huge from all the awesome food. I don’t know why, but James looks like a shifty bum in that photo. So after my awesome day of snowboarding, James and I walked to Queen Anne for my birthday dinner. Panos had gotten a very high rating on Urbanspoon and Yelp and James had been pressuring me to pick a birthday restaurant, so I figured it was as good a choice as any. Which reminds me! In February James randomly asked me what I wanted for my birthday, which was weird because my birthday was a month away and frankly we’re just not that organised. But at dinner with friends James was telling the story and that’s when I found out what happened. I had asked him the date (because I was filling out a form) and he looked it up and it was February 21. But his brain saw the 21 and went “Shiiiit! Oh God noooooo!”. Then he realised it was February but because of the panic he wanted to be informed for the following month. But anyway, back to the dinner. 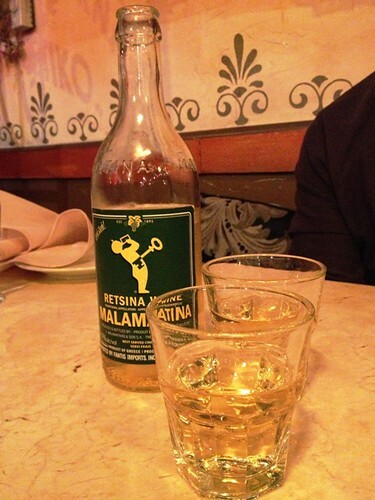 We started off with some Greek booze. I wasn’t a huge fan but James seemed to have fond memories of drinking it with his parents. We ordered a bunch of small dishes to begin with. 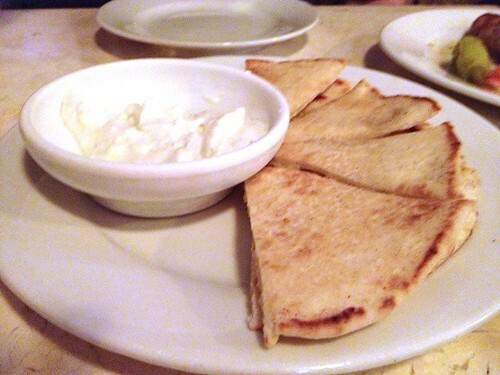 This was the pita bread and tzatziki that came with my main (which I generously shared with James). I love toasted pita bread – something about lightly charring it elevates it from “good” to “out of this world”. I was less impressed with the other appetizers. 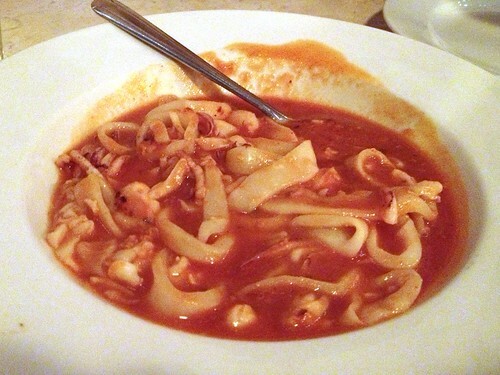 This one was James’ pick; it was tender squid in a rich tomato and wine sauce, seasoned with clove and cinnamon. 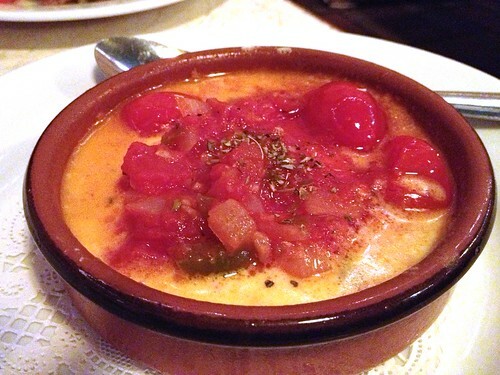 It was described as “spicy hot” on the menu but it wasn’t very flavoursome; I have a vague recollection of tomatoes, chewiness and a fairly lackluster presentation. James also went with some orange and anise-seasoned sausages. This was better than the squid but not really anything special. 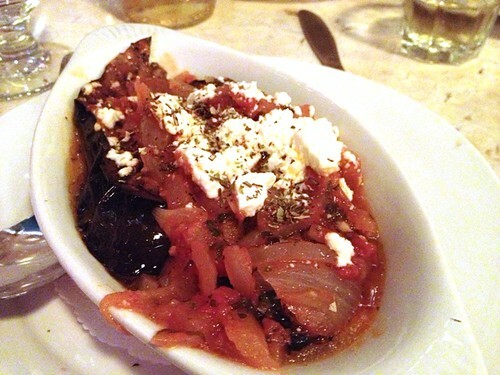 I chose the roasted eggplant topped with tomato and feta cheese. Once again there wasn’t really a lot to say about this one. 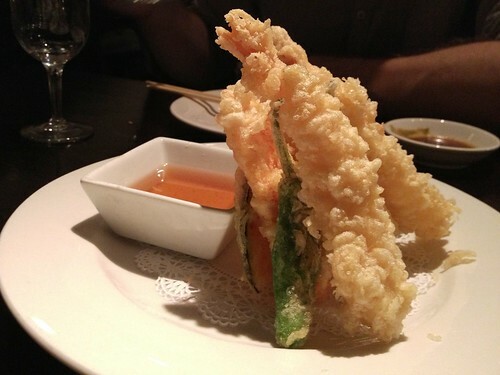 So 2/5 on the appetizers. Apparently our meals came with salads and they arrived maybe 5 minutes before our mains. 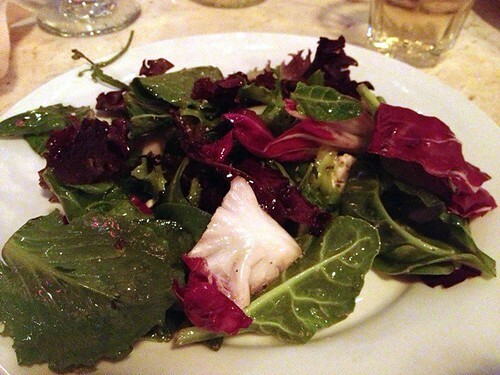 I really didn’t care for the salad; all the leaves were drenched in oil to the point where I felt pretty gross eating them and didn’t finish. James and I both ordered lamb for our mains. 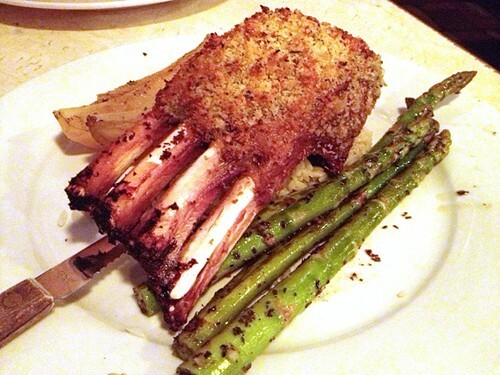 Mine was the special of the evening: a breaded rack of lamb with potatoes and asparagus (plus the earlier pita bread and tzatziki) on some fancy rice with herbs and seeds. 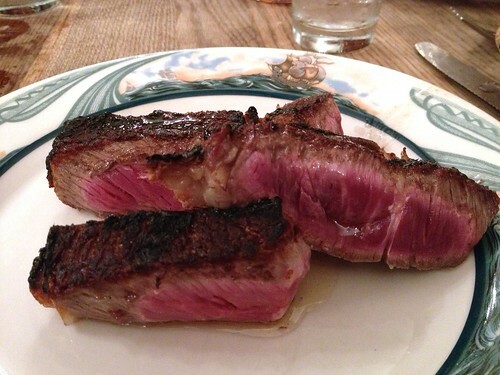 It was alright but the lamb was a tad rarer than I’d like (it was red throughout – I prefer it red at the very center but mainly pink) and once again super, super oily. Every time I picked up the lamb (that’s right, I ate it with my fingers) I’d have to wipe it on the napkin and I also had to keep wiping my lips because they were getting coated with oil. The asparagus and potatoes were also really oily. There wasn’t anything wrong with the taste but the mouthfeel was a little gross and I find it offputting when everything comes out glistening. 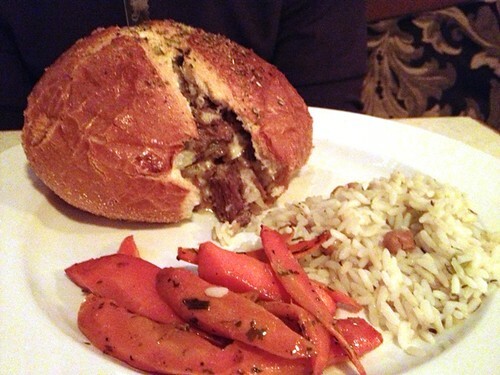 James fared better with his choice: slowly-roasted lamb baked inside a round of sourdough bread. When the bill arrived James was surprised at how reasonable it was. It was a little over $130 including tip – I guess it was cheap compared to his birthday dinner. Overall it was tasty but not particularly memorable and I really wish they hadn’t drenched everything in oil. 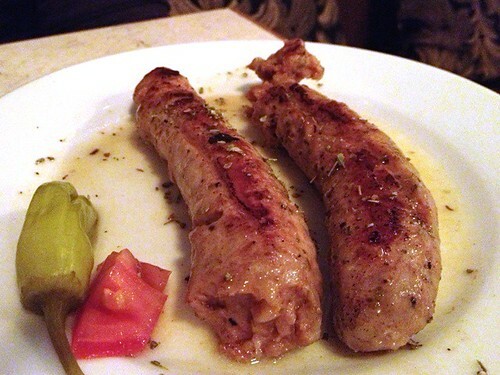 But like I said earlier I don’t know much about authentic Greek food – maybe it’s supposed to be like that. We ordered some baklava to go and rolled ourselves home. We had originally intended on eating it when we got home but were both feeling a bit sick so saved them for the next day. Overall I don’t regret going but it didn’t impress me like it seemed to all the other reviewers. I mean, 90% on Urbanspoon? That is a high rating for what is a pretty average restaurant. I’ve mentioned this before but I really wish that Urbanspoon had a “meh” option. I didn’t strongly like or dislike Panos, but there’s no way this is a 90% restaurant. 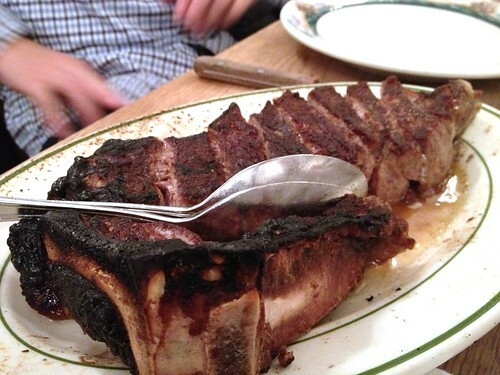 To me 90%+ is a meal that’s memorable in every way, 85%+ is excellent and 80%+ is very good. I felt like Panos was maybe 70-75%.